It took a lot of guts in this day and age to attempt a 60:00 match. Nowadays, it's considered gutsy to put on a 10:00 match on television and you never see anything but PPV main events last more than 20:00. The participants, Rock and HHH, went 36:28 at Wrestlemania. 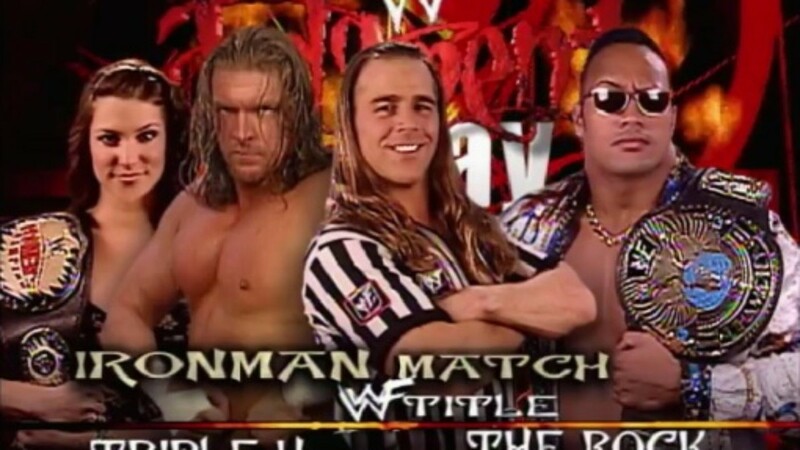 Several times during the broadcast of this show it was noted that both of their longest matches was a 30:04 PPV draw in 1998 which was a ***1/4 match. The Mania match was generally considered a disappointing match, as it dragged toward the end. So if the two felt they had something to prove, they proved it. It was far from the best 60:00 match in wrestling history, but it was, despite a timing snafu at the finish, an excellent match capping off the Judgment Day PPV on 5/21 at Freedom Hall in Louisville, KY.
Helmsley won the WWF title, via a DQ in the 11th fall, which actually ended at 60:08, which wasn't supposed how it was supposed to happen. A sellout crowd of 16,827 in the building, which was 15,886 paying $596,050 and another $130,256 in merchandise, saw, with a few seconds remaining on the scoreboard clock, panicked officials turn the clock off which negated the buzzer going off at the 60:00 mark, realizing they were in a position where it would be at least ten seconds from the scheduled DQ and then hit the buzzer after the tombstone on HHH by the returning Undertaker, which caused Rock to be disqualified in the final fall and thus lose six falls to five in a match where the title could change hands via DQ.